A Christmas quiz with 40 questions. Some are obvious, some odd, most can’t be Googled and a few are fiendish. By all means have a go and there’s a token prize for the winner but most will probably find fun in the answers that will appear here next week. 1: Name the “Santa” dressed in red pictured above. 2: Name the (sometimes) helper dressed in green(edge) kit below. 3: Which team won the Giro d’Italia’s “fair play” award for the fewest fines and penalties accumulated during the race? 4: Slow: who finished as lanterne rouge in the Tour de France? 5: Name the one day race that saw a significant diversion to its route because of a landslide on the day of the event? 6: What was the biggest winning margin for the overall classification in a grand tour? 7: Chris Froome famously ran up Mont Ventoux. Name a rider who won a World Tour race by walking their bike across the line. 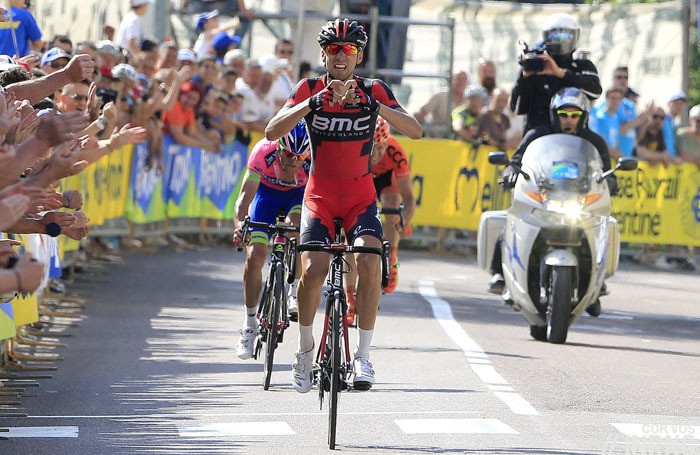 8: What’s Nacer Bouhanni’s victory celebration about? 9: Which pro cyclist took the most wins in 2016? 10 and 11: Name the owners of these legs in the photos above and the photo below. 12: Ag2r La Mondiale’s capitaine de route Samuel Dumoulin launched a new business venture this year. Doing what? 13: Giant-Alpecin’s Max Walsheid and BMC Racing’s Floris Gerts both wanted to do something else before turning pro. What? 14: Name a pro cyclist who has worked as a police officer. 15: Can a pro team change its clothing design for the second half of the season? 16: What’s the minimum wage for a 27 year old male World Tour rider? 17: What’s the minimum wage for a women’s World Tour rider? 18: When was the last time a rider finished outside the time limit in the Tour de France and was disqualified? 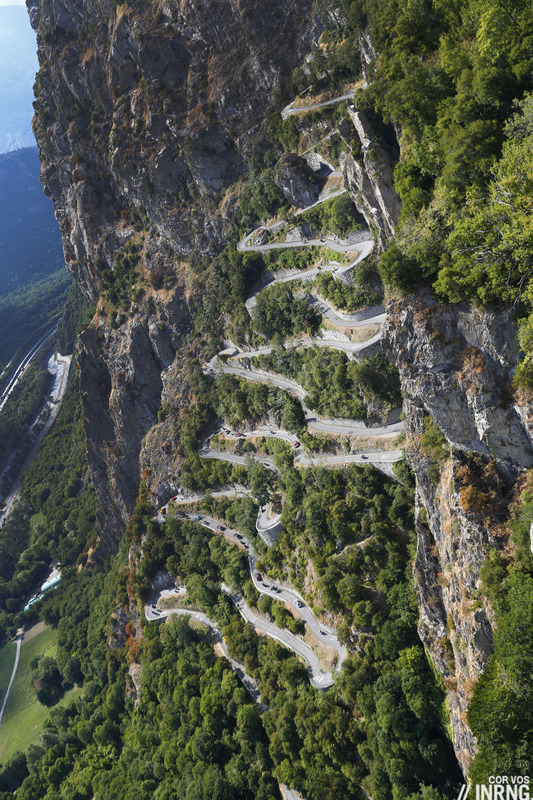 19 and 20: Name the snaking climb above; and the road below that’s so steep following cars are not allowed up. 21: Name three British Tour de France stage winners who were born outside Britain. 22: What was the highest summit finish in the World Tour this year? 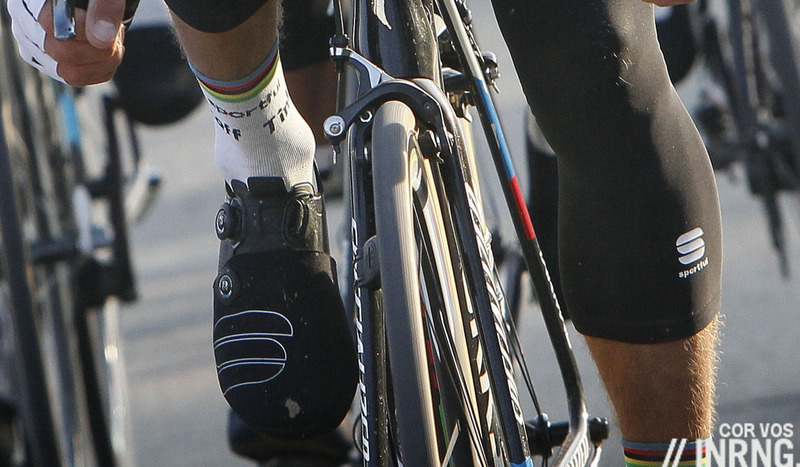 23: Which men’s World Tour team has the heaviest road frames? 24: Which squad has team cars with hybrid (combustion/electric) engines? 25: On-board cameras are becoming a thing. Are they included when weighing a bike to check compliance with the UCI’s rule on the minimum weight of 6.8kg of the machine? 26: According to their last published accounts, who has the the bigger budget: Team Sky or the sport’s governing body the UCI? 27, 28, and 29: What line of work is Drapac in? What does Soudal make? What does the Jumbo in Lotto-Jumbo do? 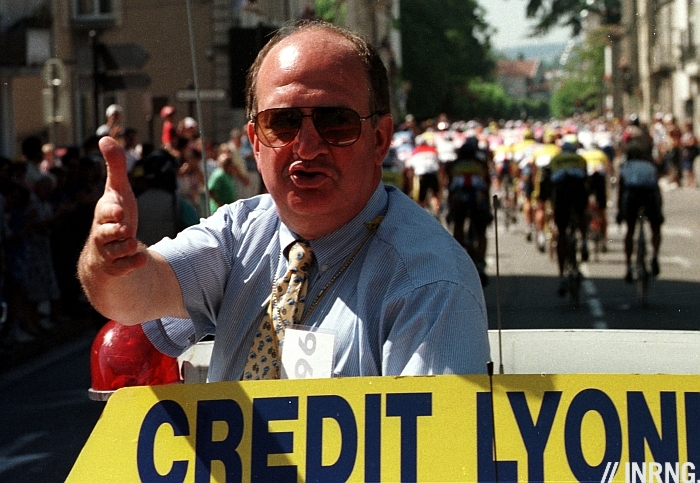 30: Which 1990s pro team was a money laundering front for organised crime? 31: Lucien Bluyau died this year. He was famous in the peloton for handing up drinks to the riders but he’d been a pro in his time. Name a race he won. 32: When was the last time Paris-Roubaix actually started in Paris? 33: The Tour de France has the yellow jersey, the Giro d’Italia has the pink jersey. Name three colours used for Vuelta a España leaders jersey over the years. 34: Alberto Contador’s most recent stage win in the Tour de France was in which year? 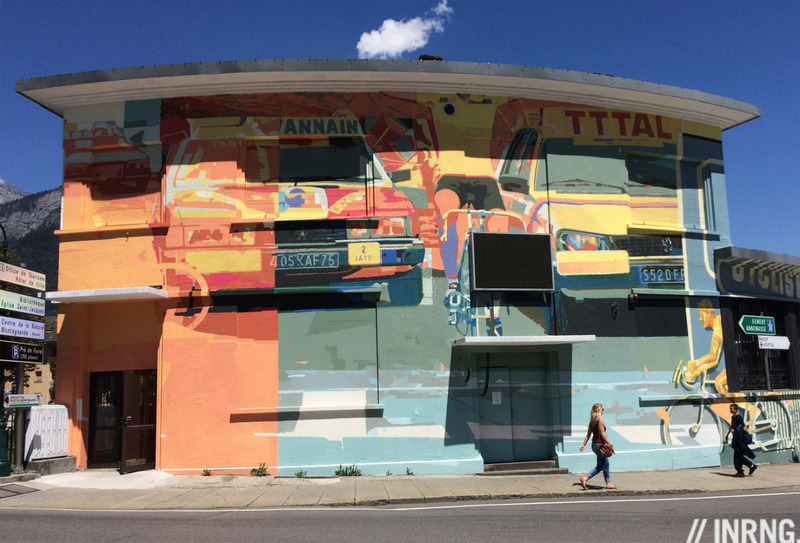 35: Name the 1980s rider featured in this mural which was unveiled in Sallanches, France this year? 36: Like father, like son: name a current male pro cyclist whose father was a pro cyclist. 37: Like father, like daughter: name a current female pro cyclist whose father was a pro cyclist. 38: Like father like grandson: name a current pro cyclist who is the third generation of professional cyclists in their family. 39: Which the Tour de France podium finisher is that strutting about on a celebrity dancing TV show? 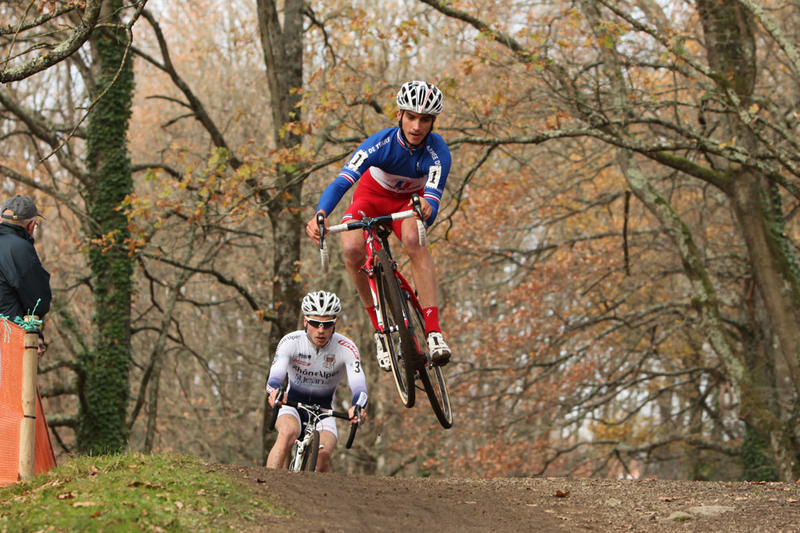 40: Who’s this rider showing some air? This is a genuine quiz rather an email harvesting attempt. I don’t expect many to try and answer all 40 questions. Still if you want to have a go or maybe readers collectively crowdsource their way together, feel free to leave your answers in the comments below and the deadline is midday Euro Time on Tuesday 27 December. As an incentive the winner gets some packets of Segafredo coffee from Italy and two INRNG supporter caps. The most correct answers wins and if there’s a tie then a name gets picked at random. Obviously people can copy off each other which spoils the point of it all but if you want to wheelsuck your way to victory by copying someone else’s answers and then sprinting past them with a final correct answer… …well that’s cycling. 11. Spaniard or perhaps Columbian whose surname begins with ??B?? and was ridiculed for weight gain. Betencor?? And ironically I gave an answer that was already given. 14. The (current) pro who was a police officer is Dayer Quintana – Klaus from Alpes and Andes has some excellent stuff about it. He was press ganged essentially! All that and you go MVDP on 38. Rik Zabel is the easy one no? Happy Holidays to all! And grazie mille to Mr. Inrng for another year of great posts and enjoyable, intelligent comments about them. 21: You could also have Cav as a 4th, since the Isle of Man isn’t part of Britain. If I’m correct, the Isle of Man is actually a British isle and the Manxmen are British citizens. They’re just not part of the United Kingdom as they are a crown dependency. You are correct, but the Isle of Man is also outside Great Britain, despite being part of the British Isles and its inhabitants being British citizens. So Cav is a valid answer. Yeah that’s true if Britain refers to Great Britain or the UK, so I stand corrected. Year you’re right if Britain refers to Great Britain or the UK, so I stand corrected. Although, just to clarify, Cav is not a Manxman as his mother was born in England and this link to the UK denies him Manxman status (protocol 3). Try telling Cav that to his face. Your atlas has a major publishing error if it describes Malta as anything like British. It ceased being a British colony long before Millar was born. I’m Googling right now, it’s my only chance…..
To the people answering Mathieu Van Der Poel on question 38, he’s riding for a continental team Beobank-Corendon…. so as such he’s not a pro – I think. We have a winner. All correct except for 37 because was Shara Gillow’s father David a pro… or just a top amateur who went to the Olympics. Either way it’s a high score. 1: Ivan Santaromita. 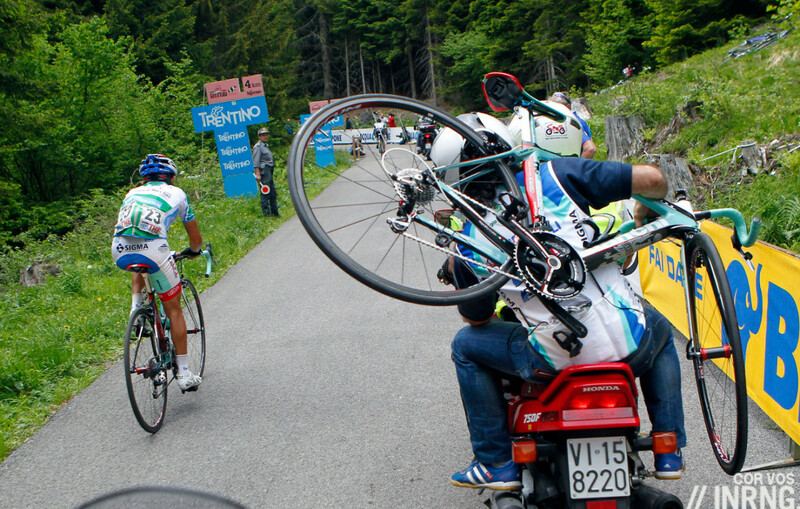 2013 National Championships Italy – Road Race. 2: Gracie Elvin (Orica Bike Exchange). 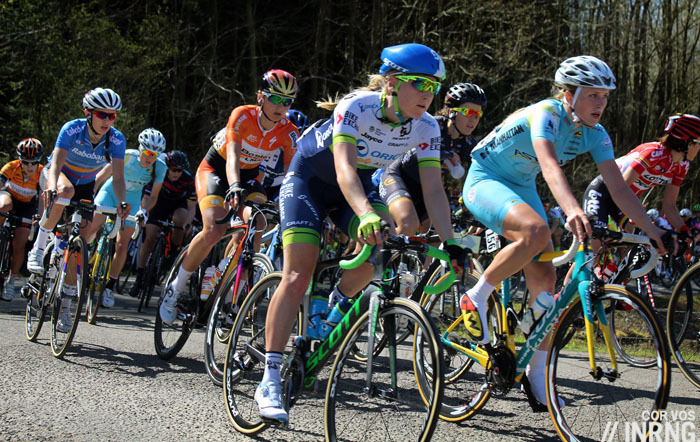 Fleche Wallonne women (April 20, 2016). 12: A bakery: “La boulangerie-pâtisserie Les Dumoulin”. 14: John Degenkolb (Team Giant–Alpecin), Hugo Houle (AG2R La Mondiale) and Dayer Quintana (Movistar). 19: The Lacets to Montvernier, also known as the Col du Chaussy. 22: Sölden, 7th stage of Tour de Suisse. 2 669 m.
26: It’s depend on exchange rate. Team Sky’s budget for the year 2015: £24.4 million. UCI’s budget for the year 2015: CHF 34.97 million. 27: Drapac Capital Partners is a property funds management business. 28: Soudal: Experts in Sealants, Adhesives and PU Foams. 30: Roslotto – ZG Mobili. 36: Julien Bernard (Trek-Segafredo) is the son of Jean-François Bernard. Moreno Moser, son of Diego Moser. Nicolas Roche, son of Stephen Roche. Taylor Phinney, son of Davis Phinney. 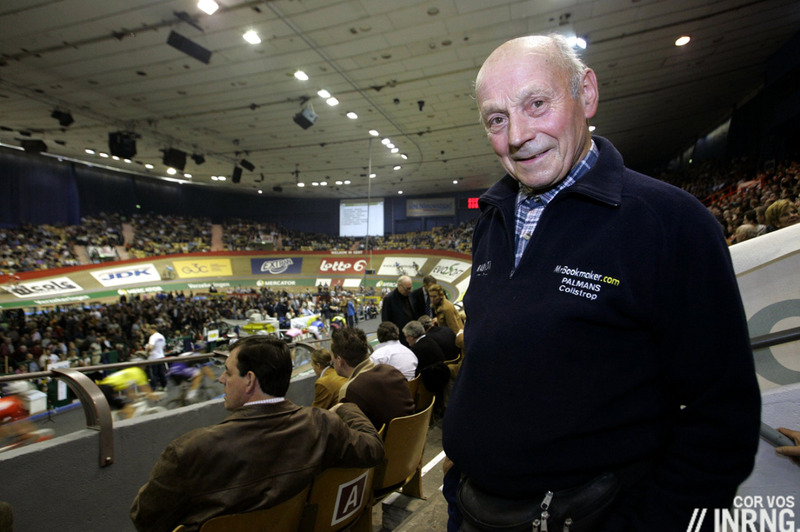 Rick Zabel, son of Erik Zabel. Boy and Danny van Poppel, sons of Jean-Paul van Poppel. 39: Raimondas Rumšas, 3rd in Tour de France 2002. Thanks for posting this quiz, enjoyed it so far! Previous post: What Happened to the 10 Neo-Pros For 2016?